This week we look at a classic console for the first time in Retro Respawn by setting the way back machine to 1998 for Neo Geo Cup 98 on SNK’s Neo Geo machine. First hitting the shores of Europe in 1991, the Neo Geo was a cartridge-based console that boasted arcade quality games in the home thanks to its cabinet-like motherboard and video cassette-sized cartridges. 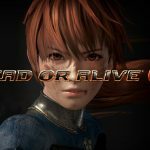 Though it was generally well received by those who owned it, that number wasn’t anywhere near as high as SNK would have liked, owing mostly to the prohibitively high price of the hardware. Looking at the console’s library of games, it’s clear right away that the main type of games carrying the machine were those of the fighting genre. There is a frankly ridiculous number of fighting games for the Neo Geo, so much so that it often feels like they didn’t make anything else for it. 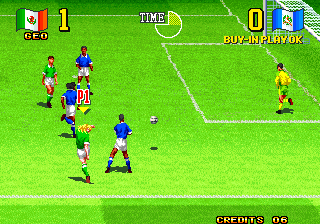 The second biggest genre on the console, however, could possibly have been football games, with the Super Sidekicks series in particular getting numerous sequels and reissues. This does make sense as football can be a frenetic and exciting game that most people in the world have at least heard of and will know the basics of how to play it. 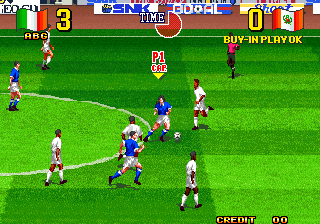 Therefore, simplifying the rules of the game and upping the tempo has usually made the sport a good fit for a bit of arcade soccer splendour, something SNK exploits quite well with Neo Geo Cup 98. 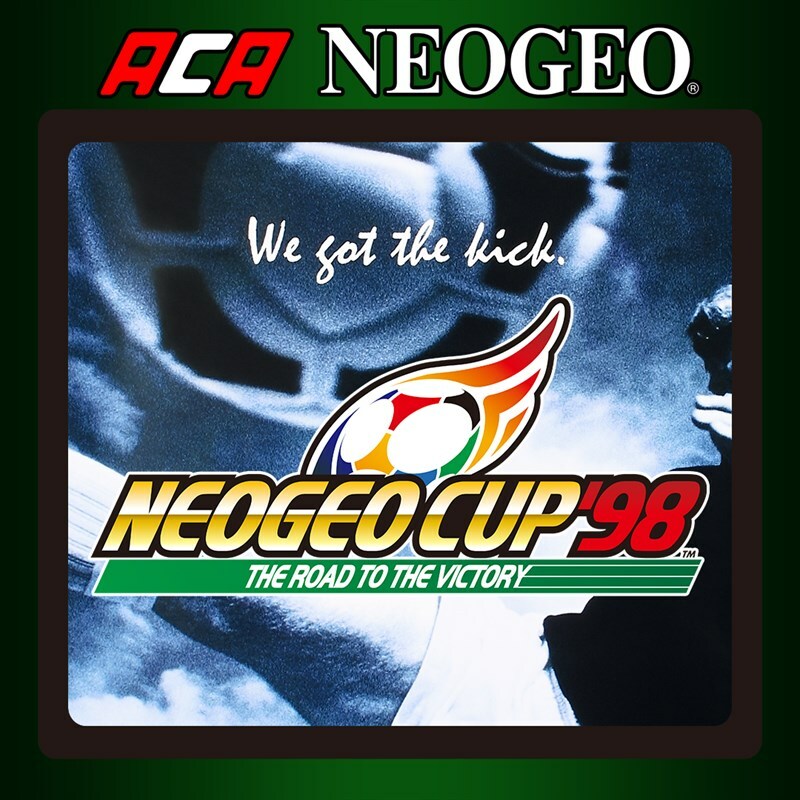 Despite attempts to the contrary, Neo Geo Cup 98 (subtitled “The Road to the Victory”) is not a crisp footballing simulation. Instead, it’s a lightning fast arcade smash and grab and works well for what it is. 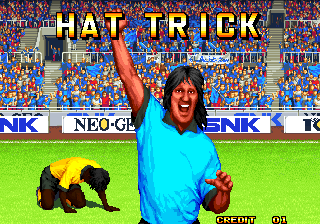 Neo Geo Cup 98 is ostensibly a reskin of Super Sidekicks 3: The Next Glory, released to tie in with the real life FIFA World Cup that was taking place in France that year. 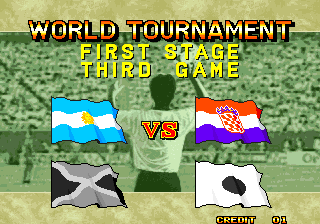 This World Cup was notable for being the first tournament that Japan (the home of SNK) had qualified for the finals, and that, combined with the fact Japan was due to co-host the event with South Korea in 2002, had led to a steady growth of interest in the sport over in the Land of the Rising Sun. With that in mind, it makes sense that SNK would try and capitalise on the new focus football was enjoying with a game to tie in with the tournament. SNK were unable to secure the official licenses, sadly, so the players go under fake names, although it’s possible to tell who each of them is supposed to be, with the designers even having an attempt at recreating Paul Gascoigne’s horrendous white blond dye job. Overall, the players look decent, although some of the facial expressions they make during cutscenes for things like goal celebrations can be pretty terrifying. An effort has been made for the players to look distinctive from one another as well, with most teams having a mixture of body types, hairstyles and skin tones. This helps keep the teams from feeling too bland and adds some much needed variety, especially as the players don’t really differ from one another when it comes to playing style. The game uses a simple three-button control scheme, with buttons for short pass, long pass and shoot when on attack, and buttons for switching players, slide tackle and shoulder barge when defending. Personally, I often found myself using just short pass and shoot when attacking, and when defending I usually tried to dispossess the opposing players by just running into their path and taking the ball away from them that way. Tackling is often more hassle than it’s worth as the referee seemingly chooses to pick what constitutes a foul or not at random, so it’s often a much safer bet just to dispossess the opposing players instead rather than risking giving away a free kick or penalty. I rarely bothered with long pass because, though accurate, it’s also a very slow and cumbersome and often gave the computer plenty of time to get where it needed to be to foil my attacks. Instead, I would often short pass into available space and run on to recollect the ball before doing so again. Short pass really goes nowhere, and you’d probably move the ball further by blowing it with a straw, if I’m honest, but it is useful for nudging the ball forwards whilst on a slaloming run towards the opposition goal. Shoot actually works very well for getting the ball up the field as well, and it’s often a better option just to shoot your way down the pitch as your players will often get onto the end of a shot and keep the ball moving. Regardless, there isn’t much room for a patient passing game here. Your best option is just to get the ball down the pitch as quickly as you can, preferably in as few touches as possible, because if you linger around trying to pass the ball, you’ll often lose possession of it very quickly. Overall, the gameplay is pretty basic, but it’s also quite enjoyable and solid for an arcade kick about. However, though the gameplay of Neo Geo Cup 98 is fine for arcade thrills, it doesn’t offer much to make you keep coming back to it when you have it at home. By the time Neo Geo Cup 98 had hit the shelves, games like ISS Pro 98 were also available and offered both deeper gameplay and more realistic 3D graphics. Neo Geo Cup 98 is fine for a quick kick about in an arcade whilst blowing away some coins, but it’s not the sort of game that screams longevity. It didn’t take me long to see everything it provided, and the lack of nuance in the gameplay means that the game just doesn’t translate as well to the front room as it might have done to a pizza parlour or bowling alley. 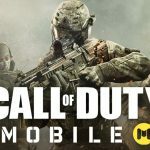 The main single-player experience is based around you picking your team of choice and then choosing to play in either one of the continental tournaments or taking on the entire globe in the World Tournament. Should you choose the World Tournament, you must first win a qualifying match before entering the tournament proper. This is usually based on the drawings from real life, so if you pick Scotland, for example, (as I did just for a laugh), you could end up taking on Austria, who were a team in Scotland’s qualifying group for the tournament. 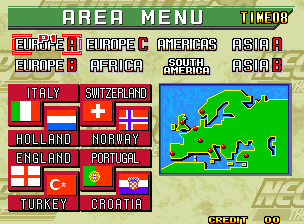 Should you win the qualifier, you will enter the World Tournament, which again models real life by drawing Scotland against Brazil, Norway and Morocco. In real life Scotland ended up crashing out of the group in bottom place, but with me taking the helm, the Scots not only fought their way out of the group but actually made it all the way to the famous trophy itself, beating England in the final, no less! Humorously, should you be able to win a tournament, you will be treated to a celebratory cutscene that simply declares “Triumph” in one of those wonderful examples of Japanese to English translation perhaps not working out exactly how the programmers meant it. Neo Geo Cup 98 is certainly not a bad game. It’s perfectly serviceable arcade fare. It’s bright, colourful, frenetic and enjoyable to play, and it can be fun if you have friends to come over and play it with you. However, you can experience the whole game from a single-player perspective in just one sitting, and I would have been sorely disappointed if I’d paid full price for this back in 1998 when there were already just as good, and in some cases better, football experiences to be had on the fifth gen consoles of the day. I’m not sure what I’ll be playing next week, but hopefully you’ll be kind enough to join me. Until then, Triumph!